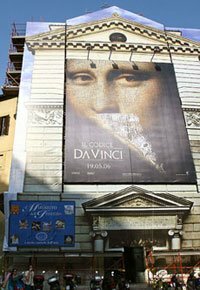 The advertisement was an enormous poster which featured the Mona Lisa, arguably Da Vinci’s most famous painting. The poster, which has the title of the upcoming film on it, has been up already for a few weeks outside the St Pantaleo Church in Rome. Can you say, "Abomination of Desolation?" I knew you could. When a blatantly anti-Christ movie is advertised at the entrance of God's House in Rome, we are getting too close for comfort. To paraphase a great line from the Great Communicator, we Catholics need to echo a prayful and collective "Pope Benedict....tear down that sign!" I would have more respect for St. Pantaleo's wayward pastor if he had commissioned and mounted a mural of Mickey Mouse with his middle finger arched skyward, in a last great act of defiance. At least no one would mistake this SIGN OF THE TIMES as a mere "movie not reputed to be particularly appreciated by ecclesiastic circles." But hey, with a name like Fibbi, the Rome Vicar was just pulling our leg...Right? It is clear we need prayer, and lots of it but we also need courageous action from our shepherds.